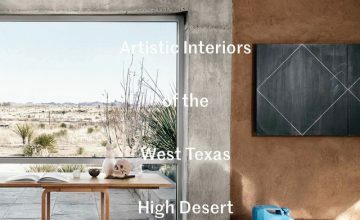 When Barbara Hill bought a 100-year-old house in Marfa, Tex., its interior was broken into a maze of little rooms. She had steel beams installed overhead for support, then cleared out the dropped ceiling and many inner walls. Her living room holds just a few furnishings, most by classic Modernist designers. WHEN you build a house from the ground up, you know what you?re going to get,? said Barbara Hill, an interior designer who recently renovated a small house in the center of this tiny town in southwest Texas. ?But when you renovate,? she said, ?it?s like a train with no brakes. Once it gets going, there?s nothing there to stop it.? As the lilt in her voice makes clear, Ms. Hill finds both railroads and renovations intoxicating. When freight trains come speeding through Marfa, just a few blocks from her house, she stops whatever she?s doing to listen and look. Their rumble and whistle, she said, are ?a passionate sound.? The repetitive shapes of the boxcars suggest a Donald Judd sculpture moving through the desert. It was Judd who in the 70?s and 80?s turned Marfa into an art pilgrimage site. In addition to creating vast sculptural installations in the landscape, he turned more than a dozen unused buildings into spare galleries for even sparer art. Ms. Hill?s house is as minimal as any work by Judd. After stabilizing the structure with steel beams, one nearly 50 feet long, she was able to remove most of its interior walls. The remaining surfaces are covered in a white plaster with so much depth it seems to emit light; objects are placed with curatorial rigor. The effect is of overwhelming serenity, as if everything is precisely where it should be. So it?s natural for visitors to ask Ms. Hill if she was influenced by Judd, who died in 1994. Ms. Hill, a former beauty queen (she was Miss Texas of 1956) with perfect manners, answers carefully. Though she doesn?t want to diminish Judd?s importance, she makes clear that she came to minimalism by a different route. In fact, Ms. Hill was a minimalist before Judd set foot in Marfa. In 1971 she opened the Cusack Gallery in Houston to show the work of artists like Sol LeWitt, Robert Mangold and Daniel Buren, who at the time were struggling. She and her four children lived above and behind the gallery. ?You could smell spaghetti when you came to see the art,? she said. The Cusack Gallery was ahead of its time. ?Nearly every show was an installation, made for my gallery and never seen anywhere else,? she said. But it was a financial failure. Houston simply wasn?t ready for the minimalist works, and most of them were shipped back to the artists, Ms. Hill said. ?I couldn?t afford any of them myself,? she said. (In 1974, she did sell one drawing by Judd, for $750). Ms. Hill closed the gallery in 1976 and lived, at times, in Rio de Janeiro and Santa Fe, N.M. While her children were growing to adulthood (the youngest is now 41), she watched the artists she had championed become international stars. That may explain her confidence about design. ?I?ve always trusted my taste,? she said. In 2002, she moved back to Houston to be near her family, which now includes seven grandchildren. There, she established herself as an interior designer, though not the type who can advertise her work with renderings of lushly furnished rooms. ?I don?t do sketches and I don?t order things,? she said. Ms. Hill?s work is about subtraction. 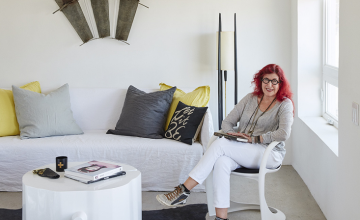 Other designers earn commissions by selling furniture to clients; she persuades clients to give their furniture away. Around the time she was putting down roots again in Houston, Ms. Hill found herself drawn to Marfa, where she had visited friends. The drive from Houston takes nine hours. ?Once you get this side of San Antonio? ? about a third of the way west ? ?the sky opens up, and the whole energy field changes, and everything just seeps out of you,? she said. ?It?s wonderful.? 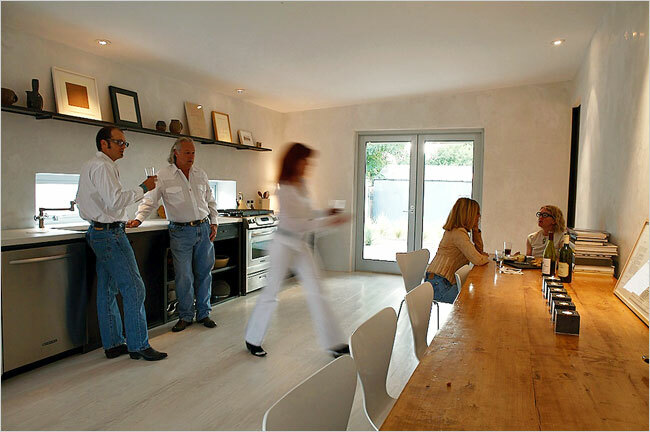 In 2003, she learned of a rather ordinary house in Marfa that was about to come on the market. While she still lives in Houston, she decided to buy it to use as a weekend retreat. ?Sometimes, when you least expect it, you get the fever,? she said of the desire to buy and renovate a forlorn dwelling. The house, built about 100 years ago, had suffered several haphazard additions, including a sunroom, which Ms. Hill removed. ?People said, ?You can?t take them off. They?re square footage.? But I wasn?t concerned about square footage.? Inside was a warren of small rooms, their walls covered in imitation wood paneling. Ms. Hill was determined to create a few big rooms in place of many small ones. 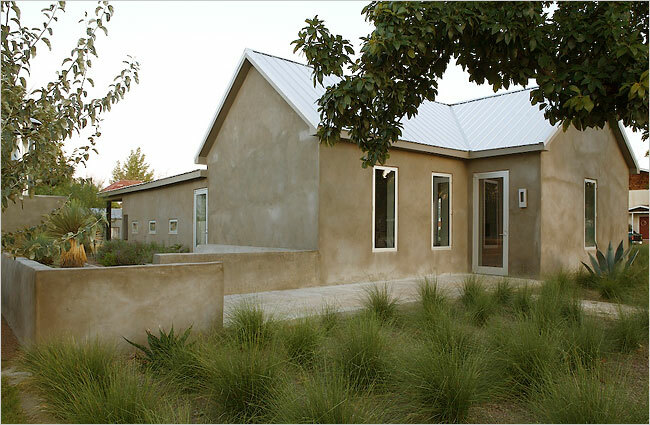 But the outside of the house is made of adobe blocks. Adobe walls can support a lot of weight, but they are prone to shifting and even toppling over. The interior walls had been keeping the structure stable. Ms. Hill wanted to save the old adobe walls, which in some cases are 18 inches thick. Adobe, she said, ?has a soft feeling that?s completely different from concrete block. It?s embracing. And it is warm in the winter and cool in the summer. And it?s quiet.? To keep the adobe in place without the stability of interior walls, Ms. Hill wanted to insert steel beams overhead. ?The engineer kept saying that we couldn?t do it,? said Ms. Hill. ?I had to talk him into saying that we could.? In the meantime, she removed the dropped ceiling of acoustical tiles. ?When I could see the rooflines from the inside,? she said, ?the house really started speaking to me, to tell me how beautiful it could be.? In the end, I-beams were hoisted up to the ridge line with a crane, supported temporarily by telephone poles, and then welded in place. The metal wasn?t painted, but was covered in a rust-protecting chemical that gives it a mottled appearance. The new layout ? about 1,800 square feet ? includes only one interior door, which shields Ms. Hill during the walk from bed to bath. Otherwise, nothing impedes the flow of spaces. The interior walls are covered with white plaster, Diamond brand by American Gypsum, which Ms. Hill described as ?very organic, with blobs, runs, drips, streaks. You don?t control it,? she said. ?It has a life force of its own.? New pine floors were sanded right up to the walls; she didn?t want moldings. When the renovation was complete, Ms. Hill imported a small collection of furniture from Houston in a U-Haul. The glass coffee table, which contains a hay bale ? perfect for rural Marfa, she said ? is by the Art Guys (the Houston-based conceptual artists Michael Galbreth and Jack Massing). 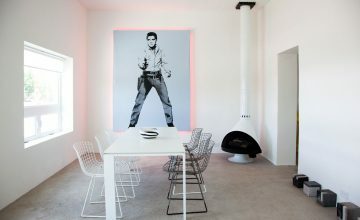 Flanking the table are two sofas by Charles and Ray Eames; other furnishings are by midcentury stars like Harry Bertoia, George Nelson and Raymond Loewy. But there are plenty of anonymous pieces, including an old French work table that dominates the kitchen. Ms. Hill won?t reveal the cost of the renovation, but she said, ?People would say, ?Golly, you could have built a new house cheaper.? ? ?Perhaps I could have,? she said, perched on an Eames sofa and looking up at the white-plaster ceiling framed by bluish-black steel beams. ?But a new house wouldn?t have this feeling, would it? ?